New York- Drom, located at 85 Avenue A, in New York, NY proudly presents Gene Ess and Fractral Attraction ‘Eternal Monomyth’ Album Release Celebration on Sunday, April 26 at 8:30 PM. Tickets at $15.00 in advance and $20.00 at the door and can be purchased online by visiting www.dromnyc.com or by calling (646) 791-4244. 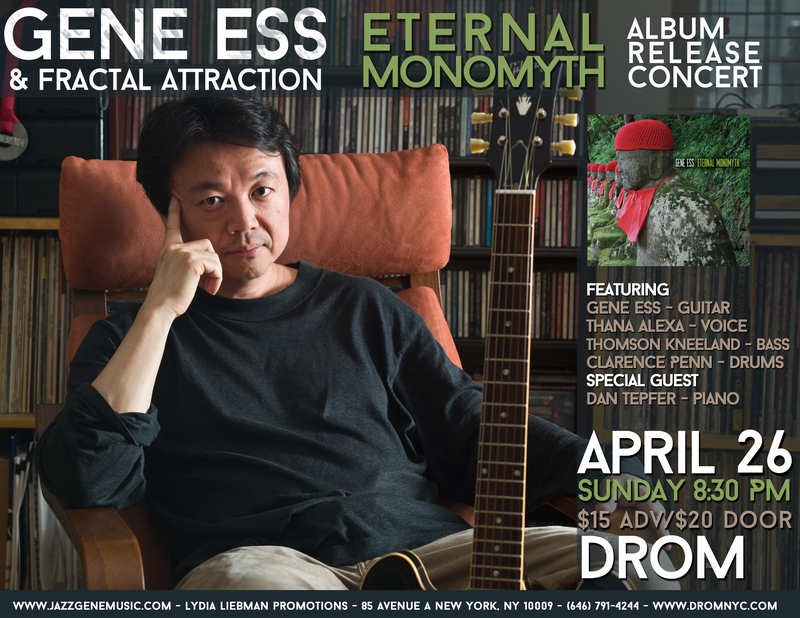 ‘Eternal Monomyth’, the latest album from Gene Ess, will be formally released on April 27, 2015, following the album release celebration at Drom. This set of new music continues Gene’s exploration of using the voice as an instrument in a chamber group setting. The album is a companion piece to the SESAC Outstanding Jazz Award winning album ‘Fractal Attraction’, which garnered international acclaim and peaked at number 3 on the national jazz radio chart. Joining Gene is a stellar lineup featuring some of the most sought after names in jazz including vocalist Thana Alexa, (winner of the 2011 Jazzon Alpe-Adria International Award), bassist Thomson Kneeland, world-renowned drummer Clarence Penn and special guest, pianist Dan Tepfer.